After the launch of their recent album ‘///’ Belgian metal band BEAR set on to the next logical step - an album tour. The album tour eventually brought the musicians to India and the buzz gradually escalated as their debut outing approached. The Indian leg of the tour lasted two weeks. Rock Street Journal attended BEAR's performance in Delhi's Cafe Turquoise Cottage and interviewed the musicians to understand their review of the Indian tour. 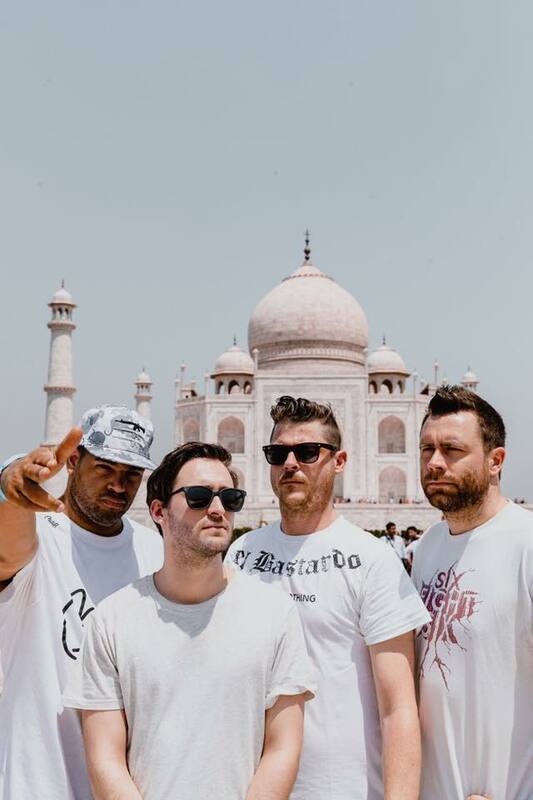 Comprising vocalist Maarten Albrechts, guitarist James Patrick Falck, drummer Serch Carriere and bassist Dries Verhaert, the band discussed the tour, the response to the album and Indian music scene. BEAR released its debut EP ‘ABSTRACTIONS’ in 2010. Followed by the album Doradus in the same year and Noumenon, two years later. Comprising of eleven blistering tracks of crushingly heavy rhythms, distorted harmonies and demonic growls, ‘///’ is BEAR’s most evocative and vitriolic recent album. "The name ‘BEAR’ came up randomly," informed Dries Verhaert. “We were looking for a name to the band that describes us. That’s when one of us randomly said ‘BEAR’ and that convinced us. It represents: heavy, in-your-face and an unpredictable personality and "Hey, he can be cute too".” Following their love for music, the band was formed in 2010. “The band started when Serch, our ex-guitarist Leander and I decided to start a project together. We had all been playing in other bands or sometimes, together, but we wanted to go for a more aggressive sound, say with Vein of Converge or The Dillinger Escape Plan. Soon our vocalist, Maarten, joined the band. Since then, we’ve released 3 full length albums, 1 EP and played on a lot of stages and festivals around Europe, and now we’re here,” added Dries Verhaert. BEAR performed across the globe and successfully created music, but the eight-year long journey was never a cakewalk for them. “Irrespective of the good music scene in Belgium we pursue other professions. Because not everybody can sustain themselves only through music. And BEAR is a fairly new band, we still have a long way to go. Everybody in the band works fulltime. I am a graphic designer and photographer for first Division Basketball team in Belgium. Maarten Albrechts is also a graphic designer and graphic coordinator for a newspaper, James Falck works in retail with a subsidiary of L'oreal and Dries (Verhaert) is a mathematics and music teacher in a school,” elaborates Serch Carriere. The band's tour received support from six Indian bands for opening act duties, and the members of BEAR eventually grew a strong opinion of what they noticed. “We were all surprised to see the level of precision with which the fellow bands performed. Right from Escher's knot, False Flag, Primal Abuse, Tangents, Warwan and Rectified Spirit, they're well-versed with their genre both as a band as well as individuals, unlike some local bands in Belgium." Summing up the overall experience, Maarten Albrechts concluded, “Both as a tourist and musician, India has left us speechless. We had the privilege to meet a lot of individuals who were interesting in their own ways - the organisers of shows to the tour guide at Taj Mahal. Everyone was extremely friendly." The band will resume writing new songs for the next album, and assures a similar Indian outing next year.